Jan 02, 2019 - Happy New Years! Happy New Years RDE fans. It was another great year for us and I just wanted to thank you all for supporting our products--you are also supporting our parks. Looking into the future a bit, I continue to give talks; my next in Tucson on January 14 at the Historical Society there. And again in Berkeley March 3--specifics to be announced. 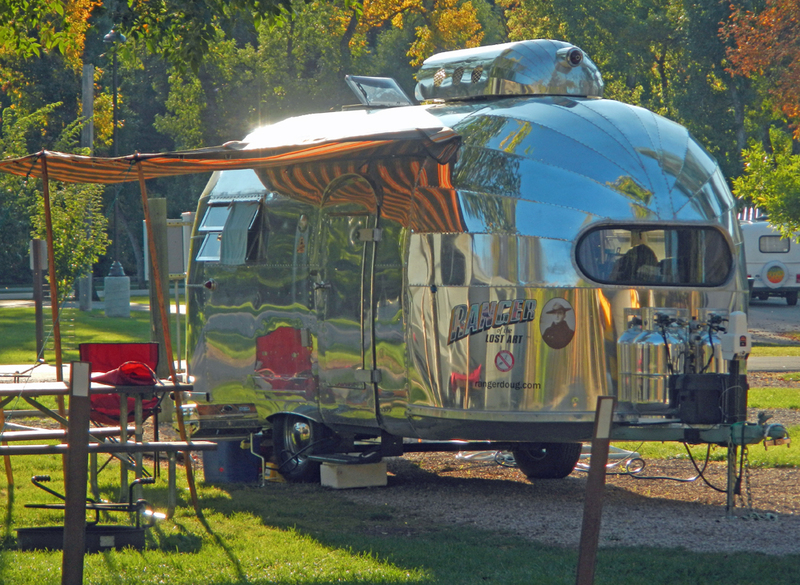 Between these talks, I attend our annual tradeshow in Denver, touring the SW in my 1948 Airstream and will be volunteering at Petrified Forest digging dinosaurs! In 2018, I've partnered with both Kelty (Ranger Doug camping line) and Victorinox (famous Swiss Army knives) and will announce more when products become available. Some proceeds will go to the Student Conservation Association. We've five new designs coming out: North Cascades, Canyonlands, Teddy Roosevelt, Jewel Cave and Mount Rushmore. When the White House decides to open government and fund our parks, I'll hopefully get these back on track and out this Spring. This is not an easy process in normal times. My most unusual letter came over the holidays--from the US Embassy in Islamabad--requesting poster art for their new Embassy. We are indeed global! Have a great and safe 2019 and visit your parks! We've had another great year and we're again holding our annual "Open Warehouse" on Saturday, December 8th, from 10am to 3pm so hold that date. We'll serve hot cider and have door prizes. 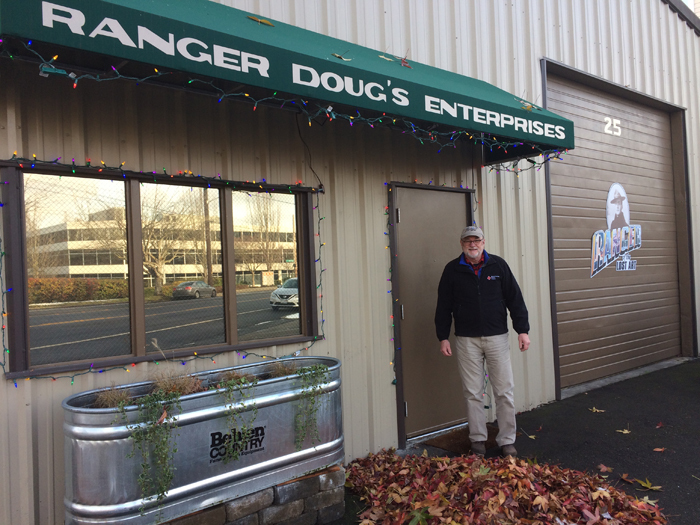 Come meet and greet our staff (and Ranger Doug) and we'll autograph posters if you want that special gift under the holiday tree. Here are some of our highlights for 2018: Ranger Doug gave a few more talks in Berkeley and at the Interior Department Met with both SOI Ryan Zinke and NPS acting Director Dan Smith to discuss park policies. Donation of my collection of original prints--appraised at $70,500! These now belong to you! We also have contributed to the Student Conservation Association, Washington Trails Association, National Park Traveler (now a 501.C.3) and Grand Teton Natural History Association I've four new designs nearly ready for release: North Cascades, Teddy Roosevelt, Canyonlands and Jewel Cave. If you live nearby--come visit us at our "Open Warehouse Sale" on Saturday, December 8. Oct 08, 2018 - North Cascades National Park design released! Just a reminder that even though the visitors center and Jagger Museum are closed, you can still purchase our clairvoyant WPA-style silk-screen print directly online. This design was developed over five years ago--we had a premonation! 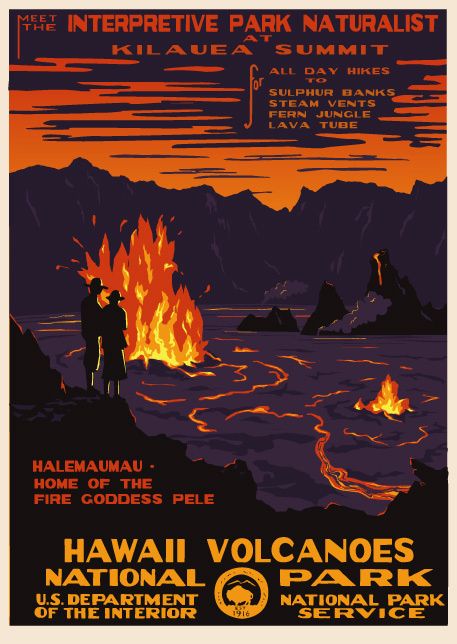 After the re-eruption (the last major one was in 1924 from which this design was based upon), Hawaii Volcanoes became our #2 best-seller after the Yellowstone Geyser (our Old Faithful #1). I would encourage anyone contemplating a Hawaiian vacation to do so--the island is open for business and from a geological standpoint, one of the most exciting times to witness our 50th state increase in size! Plenty of hotel space and no lines at restaurants! And the Kona Coast is quite sunny! 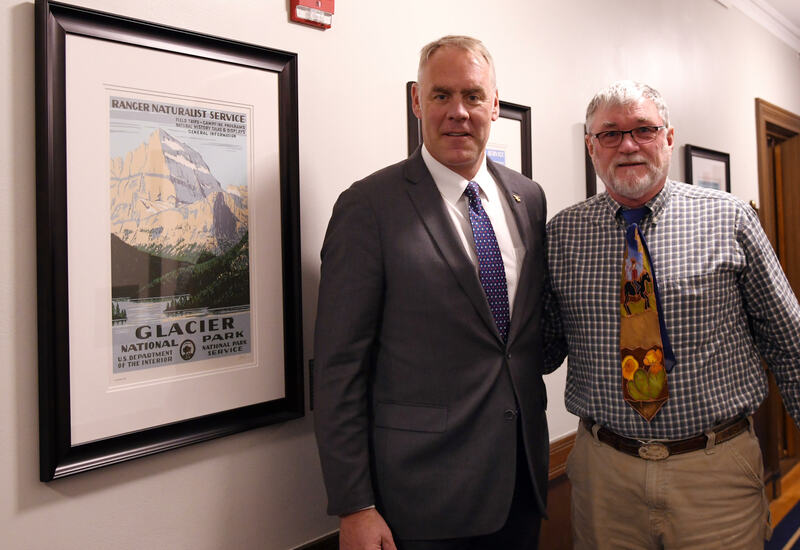 During my April 2018 Washington trip, I also met with Secretary of the Interior Ryan Zinke in his office discussing park issues and describing the unique WPA poster series. 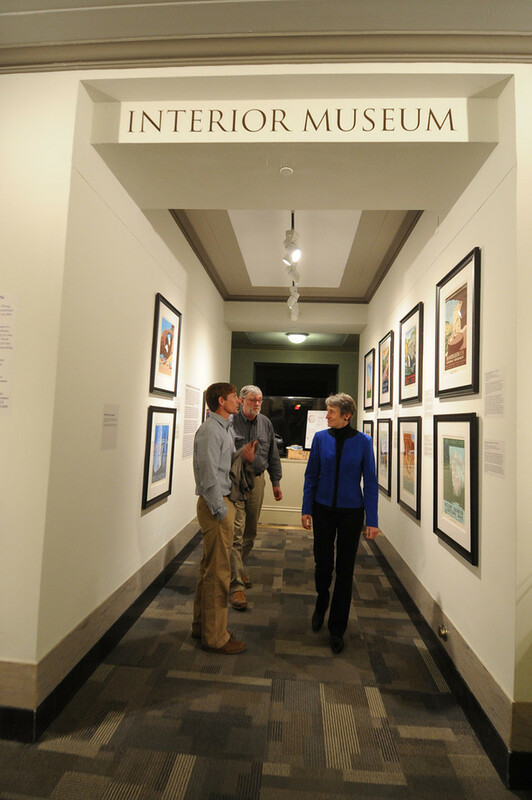 Secretary Zinke is the third SOI I've worked with beginning in 2010 with Ken Salazar (Arctic Refuge print) and Sally Jewell for the 2014 exhibition at the Museum. It's been a rare pleasure to work at this level and I hope to continue my dialog with Zinke to improve our National Parks. 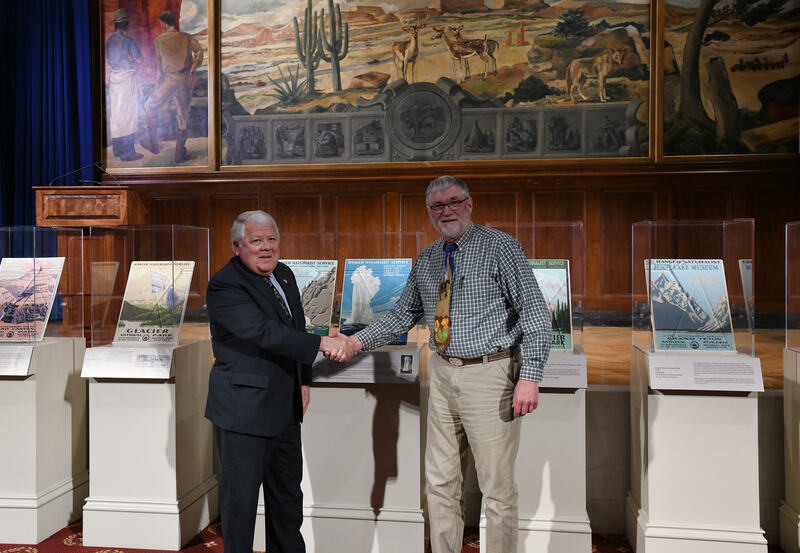 On April 10th, 2018, I donated the last of my personal collection (initially 8) of original WPA national Park posters to the NPS and the Department of ther Interior Museum. Of 14 prints originally produced, 12 have now been located and 11 are back in the public domain. Two still missing are Wind Cave and Great Smoky Mountains. 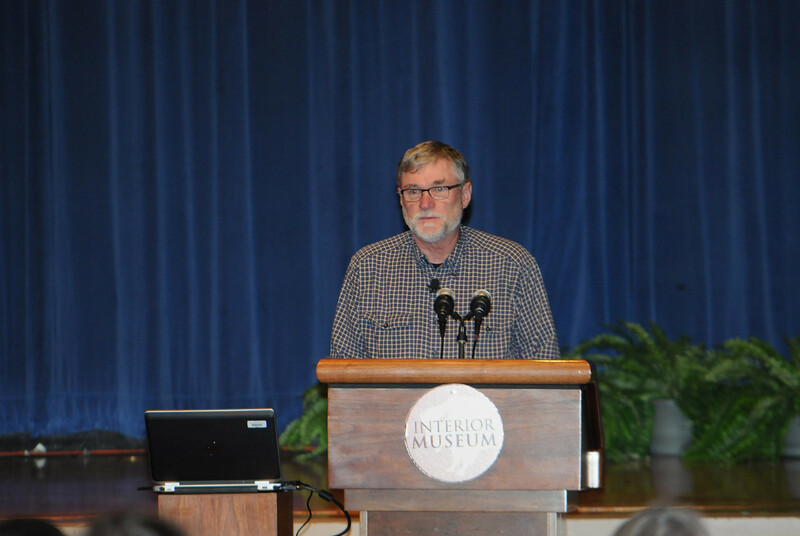 Attending this ceremony was acting NPS Director Dan Smith, the Library of Congress and the DOI Museum staff. I spent about 1/2 hour with Secretary Zinke in his office. My collection consisted of: Grand Teton (2 copies): one to that park and one to the Harpers Ferry Center Archives; Yellowstone Geyser and Falls (only known copy) to the DOI Museum collection; Mt. Rainier to the HFC collection; Glacier to the HFC; and a Zion and Yellowstone Geyser to the HFC. These last two were "borrowed" from the artist's estate 19 years ago and after involving the NPS, GSA, FBI I finally convinced the estate to deed them to me so I could recover these using civil court proceedings. The person who "borrowed" these returned them in March 2018. I'm continuing my search for the last two missing prints--Wind Cave and Great Smoky Mountains. Mar 20, 2018 - LAST AND BEST INTERIOR TALK! 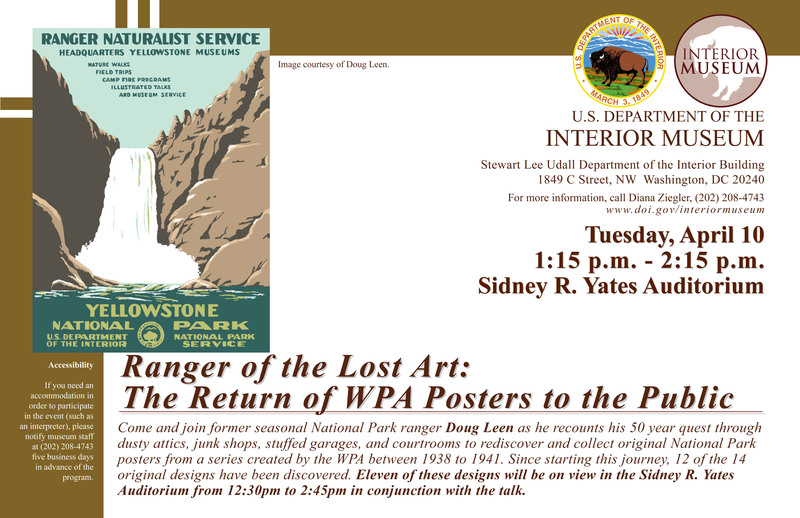 Almost four years to the day, I return to the Department of the Interior to donate my private collection of WPA prints (now 8) and to give one final talk about this unique history. Of the approximately 1400 initially printed between 1938 and 1941, I've managed to locate just 42 of these 14 images (there are some duplicates now). My donation will be to both the NPS and the DOI Museum. The Library of Congress has five in their collection. Two prints have never been found (Wind Cave and Great Smoky Mountain) and I am upping my reward to $10,000 each for these with the promise to donate them to the public domain. Eleven are now public with one solitary print (Yosemite--same reward) in private hands. I'm hoping to get all 12 known prints on stage for my talk. If you have ever wanted to vacation in Washington DC--this is the time! Cherry Blossoms too! Feb 01, 2018 - Purloined Prints Returned! Nov 27, 2017 - CYBER-DECEMBER! Ranger Doug is cyber alert and is offering free shipping from now to the end of December on poster orders over $100. We will only ship rolled in our well-protected trifold box. Great Holiday Gifts! Nov 18, 2017 - ARCTIC REFUGE POSTER AVAILABLE! The Arctic Refuge poster is once again available. Initially printed as a commissioned Sierra Club/F&WS gift to congress, I have removed the F&WS seal and the SC logo creating an open edition to raise awareness of the Zinke/Trump decision to allow drilling the 1002 region. Many of you have asked over the years if I would ever reprint this--so here it is--and in time for the holidays! Screen printed on DeNeen Environmental #80 cover with Nasdar 5500 inks. Since its inception, I've been an avid reader of National Parks Traveler and have now partnered with them for fundraising, now that they are non-profit. If you haven't discovered this NPS news source, you're missing out. Virtually everything to know about our parks is well organized and neately tucked away at this one website: https://nationalparkstraveler.org/2017/10/help-support-national-parks-tr.... For a donation of $250, you will receive a set (two prints) of our recently discovered and recolored Yellowstone WPA serigraphs. These bear the screen printer's initials "EM" and are also signed by Ranger Doug! The limited edition numbers also match--a wonderful addition to your home and a welcome donation to the Traveler. Enjoy! After 25 years of continuous growth, we've outgrown two houses and have moved into a warehouse at 25 Nickerson Street, Seattle 98109. We held an open house August 31 inviting our local galleries, block neighbors and friends. We also rent parking in the back (24 Dravus Street). Our phone and email contacts remain the same. Mar 30, 2017 - Black Canyon of the Gunnison is available in a screened print and cards! Black Canyon of the Gunnison National Monument screen print has arrived! I visited this NPS unit last fall on my 15 month centennial speaking circuit and was duly impressed. 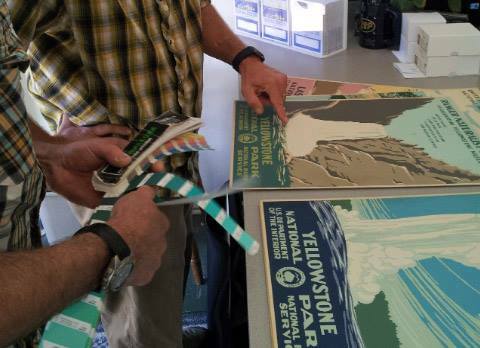 The park staff gave me a personal tour of the area and enthusiastically supported adding this to our collection of (now) 47 screen printed poster designs of our National Parks and Monuments. Modestly priced at $45. Enjoy! It was a great year in 2016 for the NPS Centennial and we're looking for another one in 2017. Here's what's happening: We're moving into a new warehouse at 25 Nickerson (also 24 Dravus) on the North Side of Queen Anne Hill, Seattle (25 Nickerson, Seattle, WA 98109) in mid-February. We will not have a retail outlet but are entertaining an occasional open house perhaps coordinated with other arts events in the community--so you can see all 50 prints in one room! Only the Department of the Interior does that! Lisa is retiring after 18 years and Angie Bunker and her husband Todd will be taking over. Angie, like Lisa, is perfect for the job--and doesn't miss a beat! Reluctantly, I'm raising my prices from $40 to $45 for our hand-made silk screened posters. This is still one of the best buys for screened art in the country! And it's been 18 years since the last price increase.....and we are printing up to a full 10 colors! 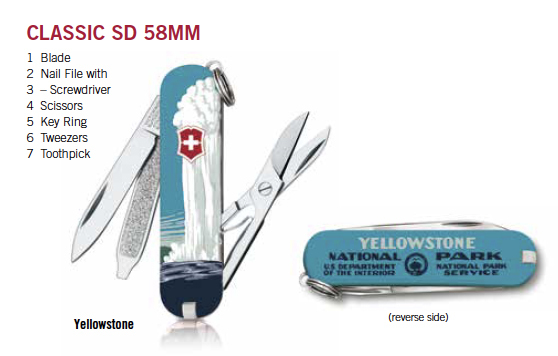 We've been asked by the National Park Foundation to continue our giving back policy for all products sold at REI. What started as a NPS Centennial Collection at REI will hopefully be permanent. This is above and beyond our 1%. When a new NPS Director is appointed, I will hopefully meet with him/her and donate my private collection back to the NPS--putting it back in the public domain. This will make eleven originals available to the public. Stand by for this one! Thank you all again for your choice of our unique screened prints. There are many others doing similar "retro" prints of our parks, but we have led the pack and will continue to do so. Happy New Year! Dec 15, 2016 - Best Xmas Present Ever! Dec 05, 2016 - WPA Calendar for Christmas! Nov 07, 2016 - Another Original Grand Canyon Found! Great news! Another original of Grand Canyon National Park turned up in Sedona AZ and was donated to the park. It came out of the estate of a Librarian who worked for the park beginning in 1951, about the time the US Mint building was closed and the posters stored there (during WWII) were returned to their parks. This one is a bit faded which puzzled me as other duplicates with similar exposure to light do not show fading. This is the 42 confirmed original and fifth Grand Canyon. Of the 14 designs made, I've found 12 (still missing are Wind Cave and Great Smoky Mountains). One Yosemite turned up 10 years ago but slipped through my fingers (and those of the Library of Congress) so three are missing from the public domain. I'll offer a $5000 reward for each of these with the promise to donate to the NPS archives at Harpers Ferry. Jun 14, 2016 - Rocky Mountains again. I'm in Jackson Wyoming giving about 16 talks over the next two weeks. Then to Glacier, Pacific NW, Oregon, California and then returning to the Rocky Mountains for my final push ending in Zion in November. It's the Centennial season so my schedule is heating up. Stay tuned to our "Events" button on this blog. This month we made both the Saturday Evening Post, Time Magazine and Outside Magazine--the NPS Centennial is heating up! I'm currently in Great Smoky Mountain (no talks here) but several to follow as I progress north up the Blue Ridge Parkway to Shenandoah and Washington DC. See our Events button for my schedule as it developes. Yellowstone Geyser WPA print make the cover of the Saturday Evening Post with a nice (online only) article on recovering this "Lost Art." Enjoy! Many parks and other venues have asked for a tentative schedule so here it is: After the March 6-10 Spokane tradeshow, I'll be continuing my my odyssey north up to the Chicago area (April), then east to Acadia and down the Eastern Seaboard parks in May-early June: Civil War sites, Blue Ridge Parkway, Shenandoah and Great Smoky Mountains. I may visit Everglades again. In mid-June I'm back in Cody, Jackson Hole, Grand Teton (June 18th) and will then work my way west and revisit Sequoia, Yosemite, then northward to Redwoods, Lassen, Crater Lake, Olympic (? ), Mt. Rainier, Glacier and rendezvous at Gardiner Mt. for the actual Centennial at Yellowstone North Gate (August 25), then Grand Teton again, Rocky Mountain (Sept 2/3), then SW parks ending at Zion November 11. This is very approximate--so visit the Events section on my Facebook Page. So far I've given 29 talks and 1200 visitors reached. I will be giving a two hour talk in Santa Fe at the NPS's Old Santa Fe Trail Building between 4pm - 6pm. This building was built by the CCC. 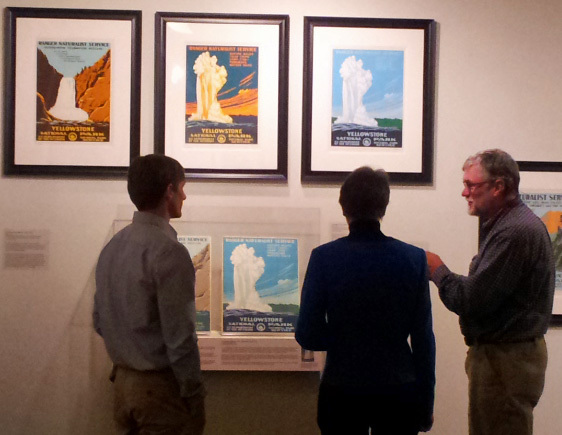 My talk is focuses on the history of the WPA National Park Poster and will feature four originals on display. See you there! Most, if not all, of our posters will be on exhibit at the US Geological Survey headquarters in Reston VA for the month of June. 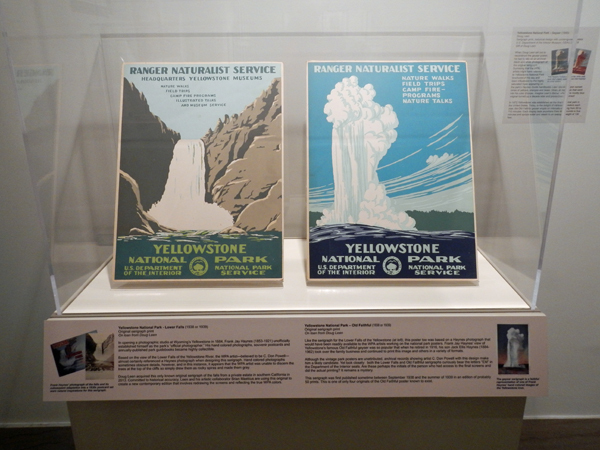 If you missed the exhibit at the Department of the Interior Museum, this is a good chance to see all the posters in one area. I'll be giving two talks in Death Valley National Parkat Furnace Creek Visitors Center on Friday, January 29 at 7pm and again on Saturday, January 30 at noon. 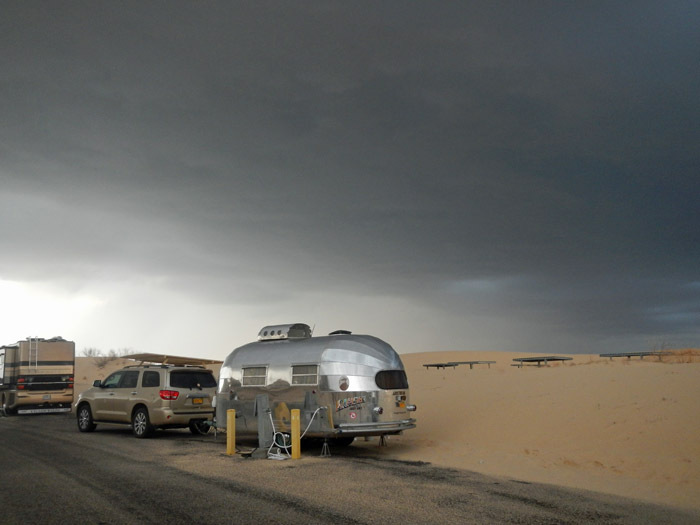 Ranger Doug will be giving three talks next weekend at Joshua Tree National Park: January 15, Friday @ 7pm at the Jumbo Rocks Campground January 16, Saturday @ 7pm at the Big Rock Campground January 19, Tuesday @ noon (brown bag lunch) at the 29 Palms Visitor Center, Rattlesnake Room. We participated in the scarf designs for the World Scout Jamboree--National Park themed, of course. Here is a link to the final ceremonies: https://www.youtube.com/watch?v=VFoM7jHcUtg Ranger Doug was a First Class Scout. Nov 09, 2015 - Pasadena Rose Bowl NPS "Kick-off"
I'm going to the Rose Bowl! Live on Green, marketing for the City of Pasadena & their Convention Center has selected my artwork for the official NPS Centennial kick-off. 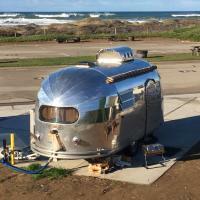 I'm giving three (or more) talks at the Pasadena Convention Center where my 1948 Airstream--highly modified--will be a centerpiece at the Convention Center. Talks at 2pm on Tuesday December 29, 10am on the 30th and again at 1pm on the 31st. Come hear this unique history of National Park art and view five original prints--the largest collection in one place-- equal to the Library of Congress. I've put all the links to newspaper, radio and TV articles in a new tab: News and Kudos/Honorable Mentions; where you'll also find a list of upcoming events. Every two years, we donate about 350 prints to the NPCA (National Parks & Conservation Association) to be presented as gifts to members of Congress who support NPS legislation. For a list of our donations, visit our Links section here. 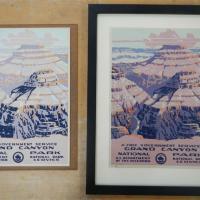 NPCA recently writes: "Dear Doug, Lisa, and Team, Thank you so much for the beautiful Evergflades prints for our awards! Members of Congress, as always, loved them. Thank you for the wonderful partnership--we look forward to working with you again soon! Best, Natalie & NPCA"
Aug 31, 2015 - Denali trumps Mt. McKinley! Those of us at Ranger Doug's Enterprises, and specifically, Ranger Doug, who lives in Alaska, applaud the bold decision made by President Obama and Secretary of the Interior Sally Jewell to change the name of North America's highest mountain from Mt. McKinley to Denali. 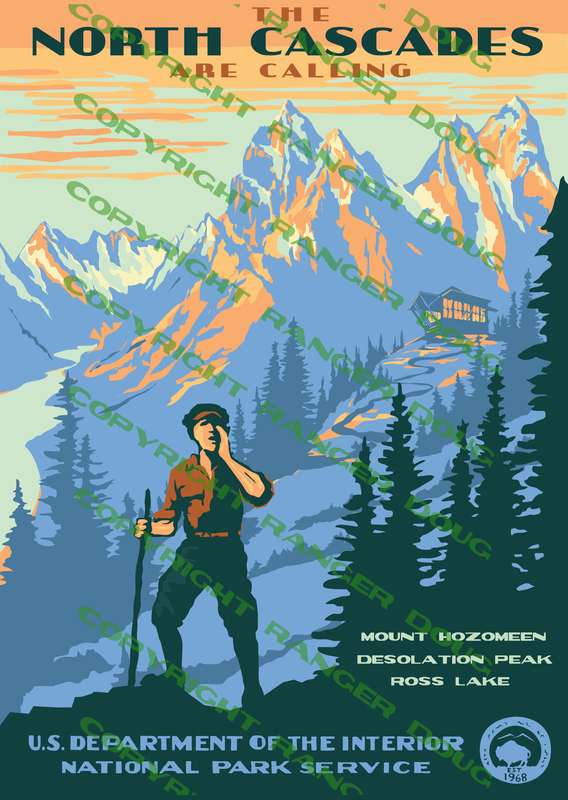 However, this begs the question.....this National Park in the WPA (1935-1943) era carried the name Mount McKinley and therefore, holding true to this history, we've named this poster Mount McKinley as it would have been published at that time. I begin my 18 month NPS Centennial odyssey in three weeks where I'm presenting my story as told to the Department of the Interior: Elk Prairie Campground State Park (Redwood State & National Park) August 22 @ 8pm , August 24 at Lodgepole Campground, Sequoia @8pm, Shell Oil (Pipeline) in Sequoia (exclusive), August 26 Yosemite (TBA), August 28 @ 6:30pm: Kimball Art Center, Park City Utah (http://www.kimballartcenter.org/art-talk/). For more details visit our Facebook page where I've listed a calendar of events as they develop. Hope to meet you all! 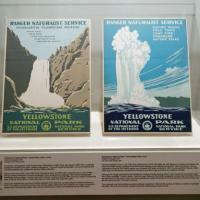 Attendance for POSTERity: WPA’s Art Legacy & America’s Public Lands From April 9, 2014 (opening day) through May 29, 2015 (closing day), gallery visitation totaled 15,712. The exhibition’s guestbook provided an opportunity for visitors to leave comments and indicate where they were visiting from. Not everyone signed the guestbook or provided visitation demographics, but of those that did, 44 states, the District of Columbia and 10 foreign countries (Argentina, Australia, Brazil, Canada, Dominican Republic, France, Netherlands, Spain, Switzerland, United Kingdom) were represented. Comments can be viewed here. Haleakala National Park print is available. It's our 44th design and is a full 10 colors--our most complex design yet. We had hoped it would be available earlier, but we redrew a screen or two and had some ink issues (the EPA has made modern inks less opaque). But it's worth the wait and still modestly priced at only $40. Enjoy! 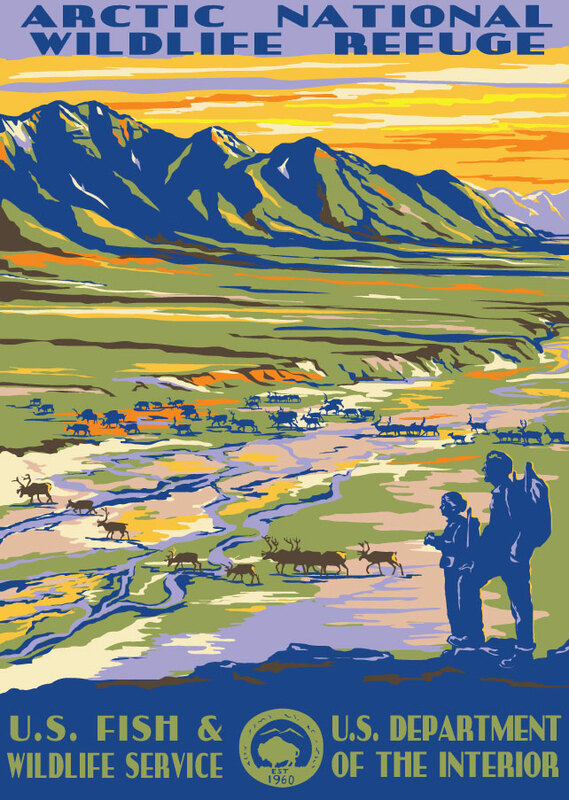 Jan 26, 2015 - Dinosaur National Monument Serigraph is now available! Dec 31, 2014 - 11,300 visitors attend DOI Museum Exhibit in 2014. 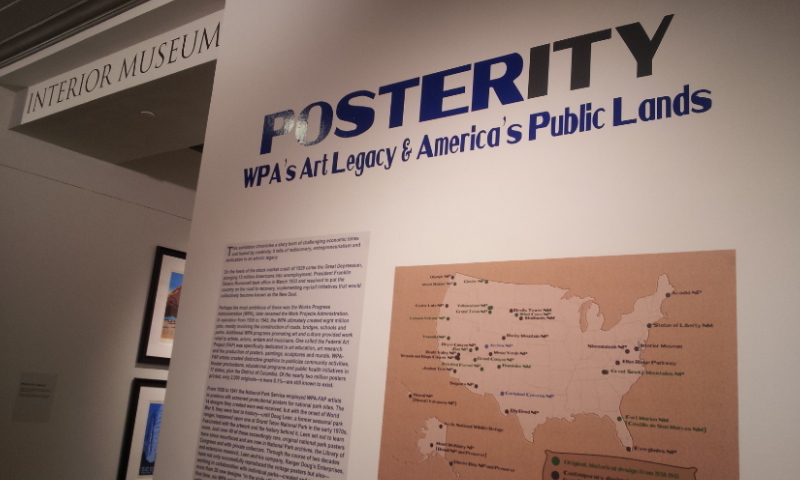 By the 2014 year's end over 11,300 visitors have attended our exhibit "Posterity" at the Department of the Interior Museum. It continues to draw people and their good comments. We hosted the artist's son, Richard Powell which we've posted to our Facebook page. The exhibit will stay open until April of 2015. Attend if you can! Happy Holidays! 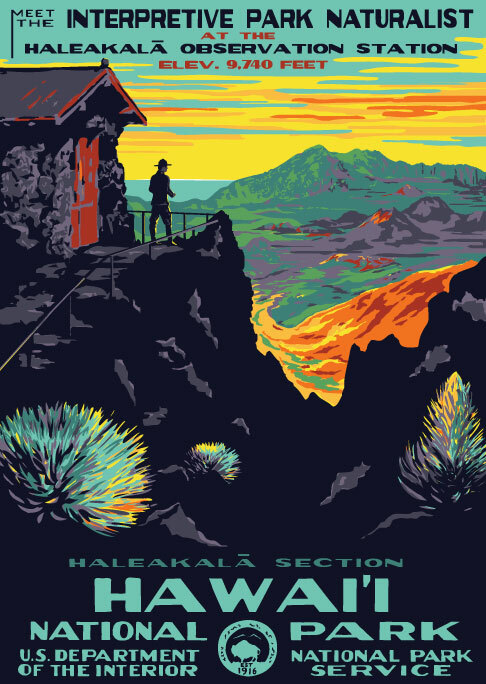 The Haleakala Screen print will be available at the end of March. We designed this to complement the Volcanoes print. Its bold colors, morning sunrise and distant ocean vistas make this print unique. And we've added a ranger! Still only $40. Dec 22, 2014 - Dinosaur National Monument Silkscreen Print due out after the New Years. 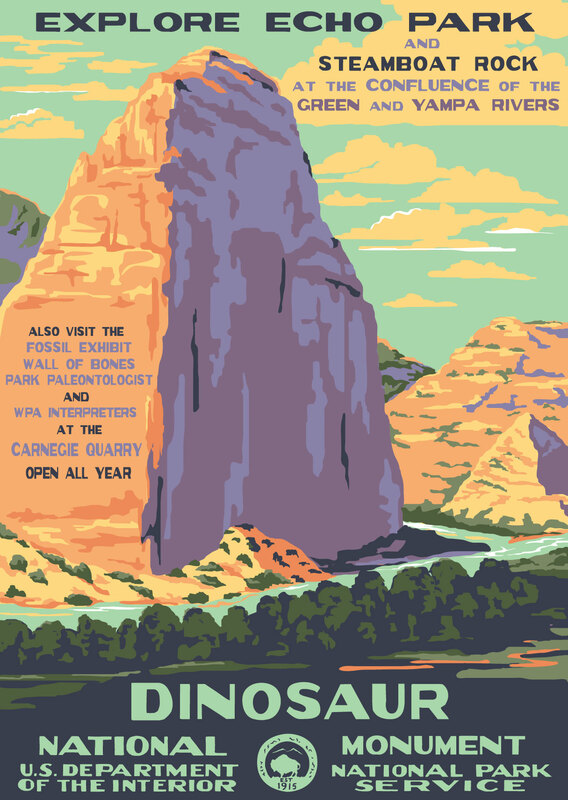 The Dinosaur National Monument print is our 43rd park design. Screen printed and still just $40. 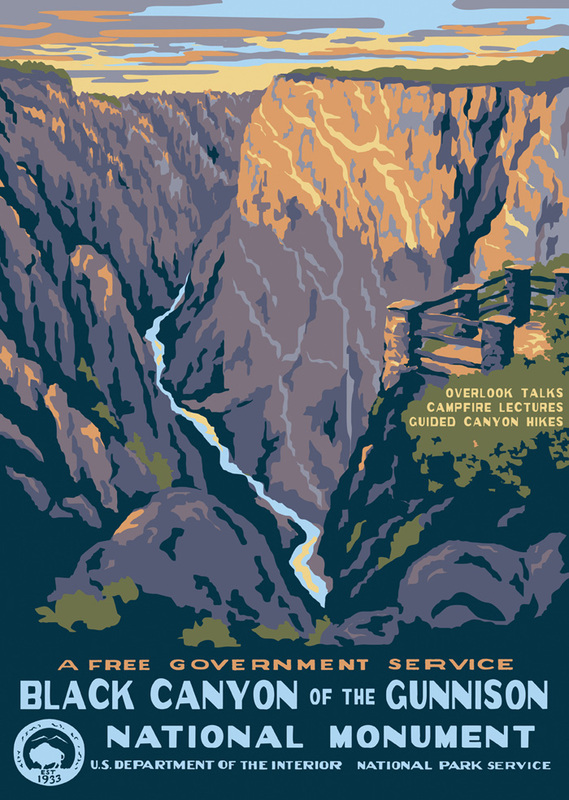 The 2015 Calendar "National Parks--Poster Art of the WPA" produced by Ziga Media is now available but only through Barnes & Noble and Calendars.com. Please note, Ranger Doug does not sell this directly on this website nor in National Parks. Typically these sell out in a few weeks although this years run is the biggest yet due to their increasing popularity. Enjoy! 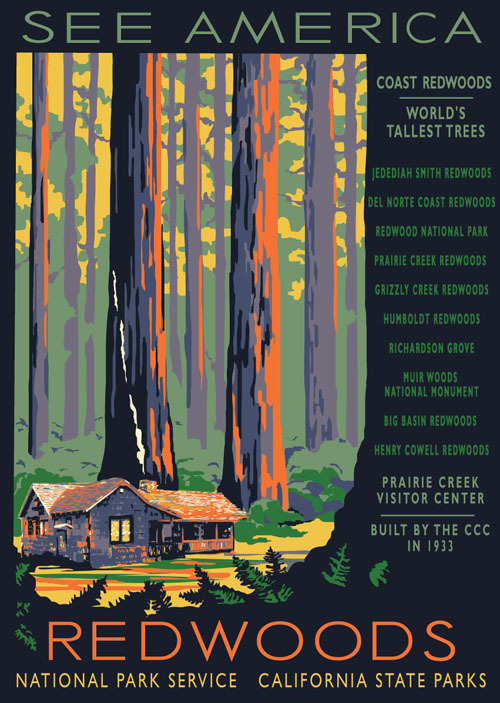 Our Redwoods image is now available. See it here... I chose the Prairie Creek Visitor Center as the focus, with a "window" style design, and using the See America theme. There are over 100 groves and this park(s) is managed both by the NPS and California State Parks. I think this is a good compromise listing the top ten groves. The PCVC was built by the CCC in 1933 and opened in 1934. We're the only ones making silk screened prints and only charging $40! Enjoy. 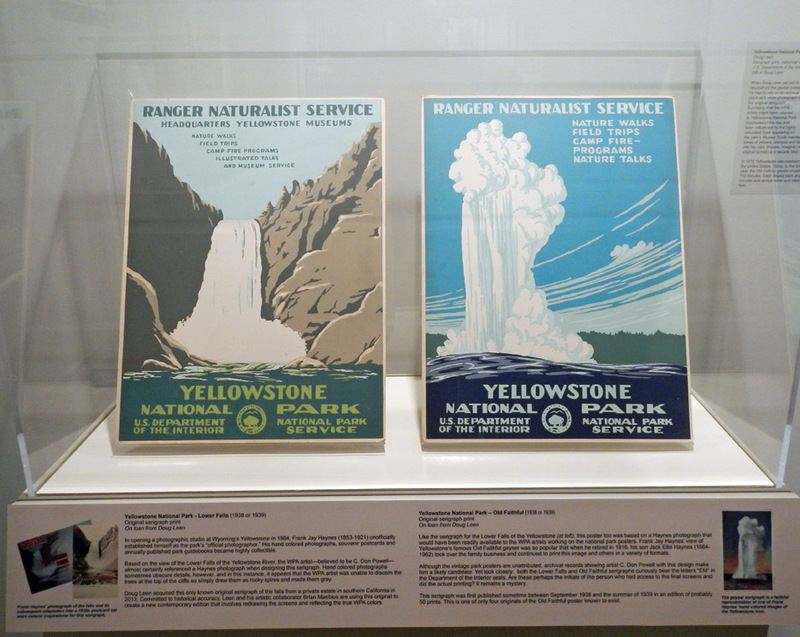 Jul 20, 2014 - Ranger Doug's NPS Centennial Offer! As promised (but a week late), we are offering for only $75, the two Yellowstone redrawn serigraph reproductions with completely corrected color & parallax--shown here behind the Secretary of the Interior, Sally Jewell. Besides being signed by Ranger Doug, these also bear the initials of the screen printer "EM" in the DOI seal and are limited to only 1000 copies sold in paired numbered sets only. Celebrate the NPS Centennial! Here is the link. 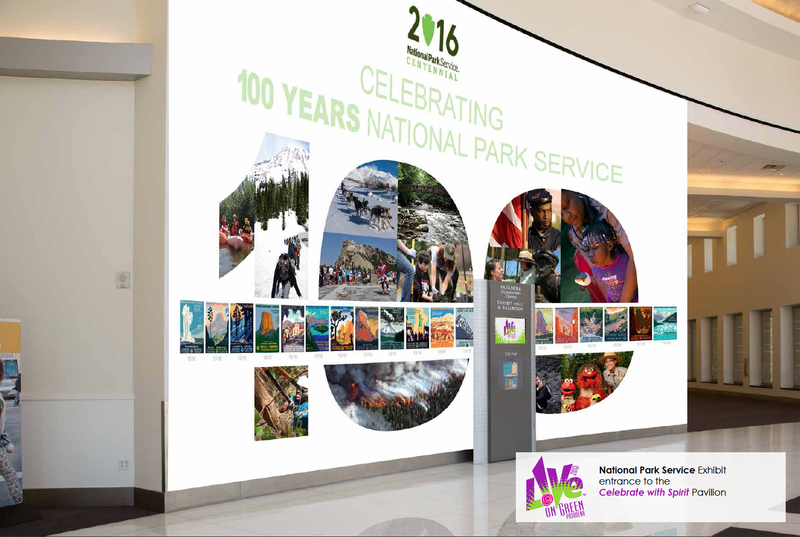 Celebrate our National Park Centennial coming in 2016! Beginning July 15, we are offering a signed special limited edition of the two Yellowstone National Park prints; the Geyser and Falls in a perfect replication based upon two recently discovered originals which are now on exhibit at the Department of the Interior Museum (pictured at left). 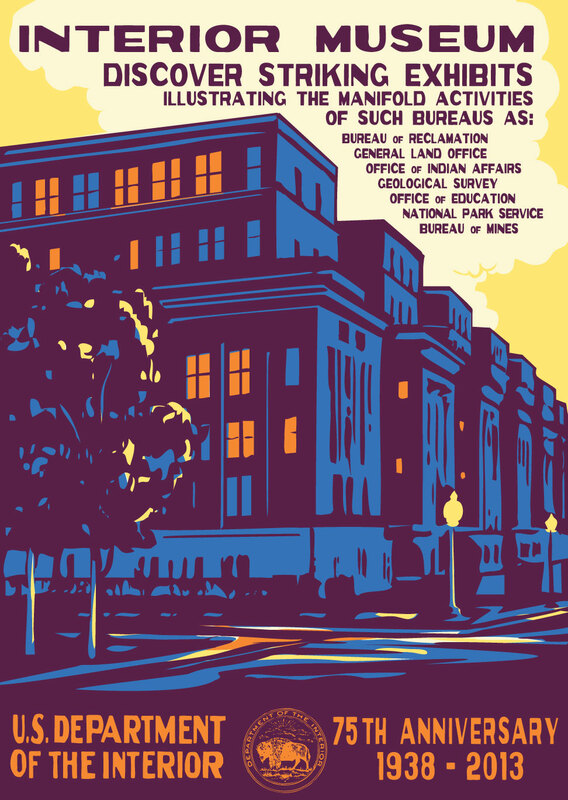 We have corrected to the original WPA colors and redrawn the screens exactly including the screenprinter's initials etched into the DOI seal; "EM." These serigraph prints will be a limited edition of 1000 and sold as pairs only (with matching numbers) until the end of 2016. Both for $75.00. We will announce availability on this news site and also on our Facebook Page when we receive them from our screen printers. An exhibit of all our artwork opened April 8, 2014 and will run for one year at the Department of the Interior Museum in Washington DC. Interior Director Sally Jewell was the first to sign the guest book and received a private tour of the exhibit. If you plan a trip back east, be sure to include this in your plans. Six originals and all or our limited editions are exhibited. Dec 08, 2013 - Originals Found! 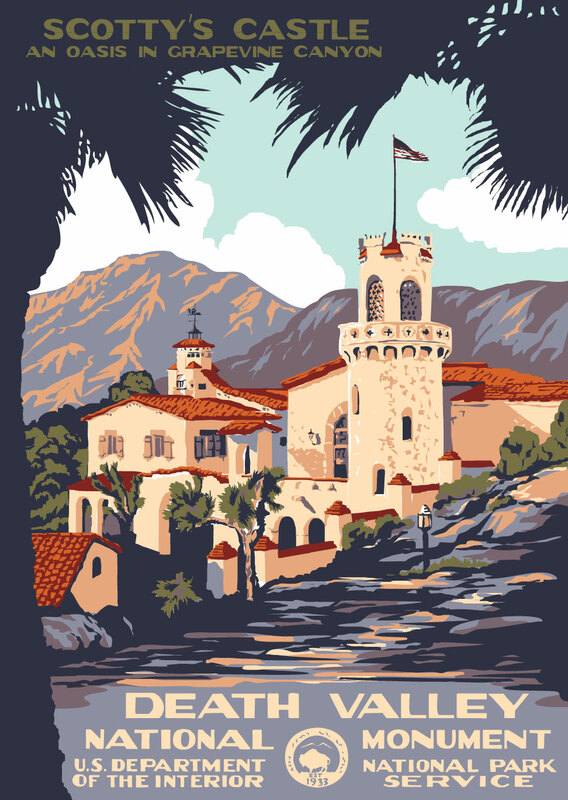 Six original WPA National Park Serigraph prints recently turned up in a private estate in Southern California making the total of originals now 40 prints! I traveled down from Alaska and examined these and purchased two: Yellowstone Geyser (now 4 known copies) and Yellowstone Falls (the only known). They will eventually be donated to the NPS archives or LOC. They were in remarkably good condition and I will be recoloring and digitizing the screens for the Falls print in the near future. Two of the original 14 prints are still at large--Wind Cave and Great Smoky Mountains--keep on the lookout for these! Happy Holidays! I know I'm preaching to the choir, but around every holiday season many counterfeits of our prints show up on the internet--particularly on websites like Etsy, Zazzle, Tripod, Cafe Press, etc. It is very difficult to penetrate these 'shell' websites and much of the offerings are of very cheap quality, yet competing prices. While five of these historic images are now back in the Library of Congress and thus public domain again, they are 'up for grabs' and are now appearing on every imaginable article--from t-shirts to soap wrappers to neck ties. Our contemporary series of 26 images are not. Please be aware of what you purchase. 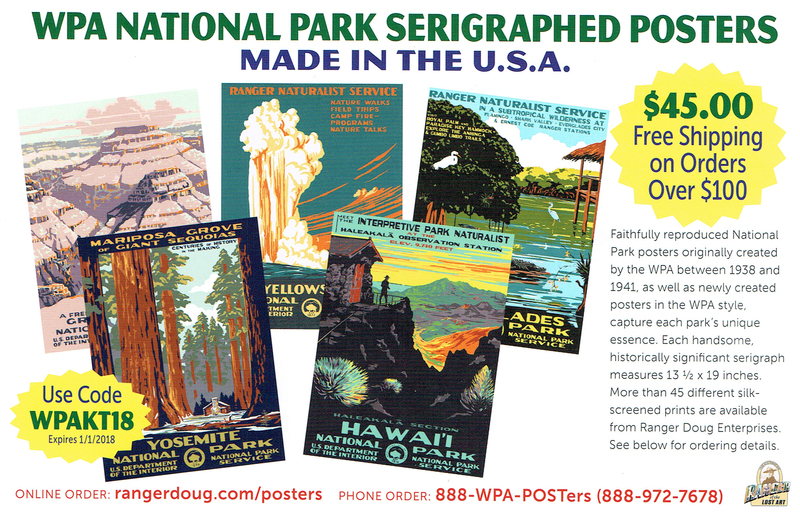 Our company, now 20 years in business, is the only source for professionally restored silk-screened WPA national park prints; and we stand 100% behind our products. Thank you and Happy Holidays! We've now received our new Statue of Liberty National Monument poster (beginning our monument series). See it here..... Joshua Tree, Death Valley and Gettysburg are on the drawing boards. The 2014 wall calendar and mini-calendar, produced by Ziga Media LLC, are now available through Barnes & Noble and Calendars.com. We do not sell calendars at RDE. Enjoy! Big Bend, Everglades and Badlands screened prints have been out for over a year and I've neglected to mention this here in our News section. We've begun using Facebook so visit us there also. 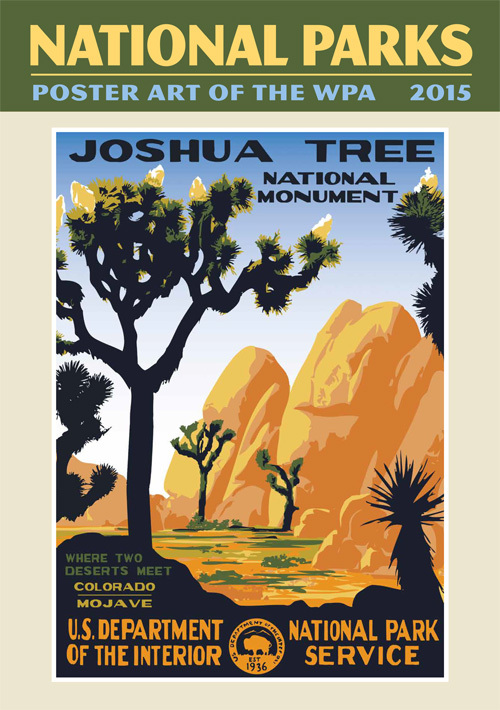 We've now received approval for screened prints of Statue of Liberty (beginning our monument series) and Joshua Tree, with Death Valley and Gettysburg on the drawing boards. We've changed our window stickers to a more durable UV resistant vinyl material, suitable for outdoor use. We've added an additional 22 new parks as contemporary designs and offer them individually or in sets of 23 (which contain an additional sticker of Teddy Roosevelt's durable grin). With our current screen printer, Scott Corey of Corey Sign, up to his ears printing our nearly 40 park images, we've brought in another printer, Cole Screenprint to help us out as we expand our inventory. While Scott is a third generation "one man shop" Cole is a family of 30 professionals occupying a 25,000 square foot facility in Tacoma Washington. 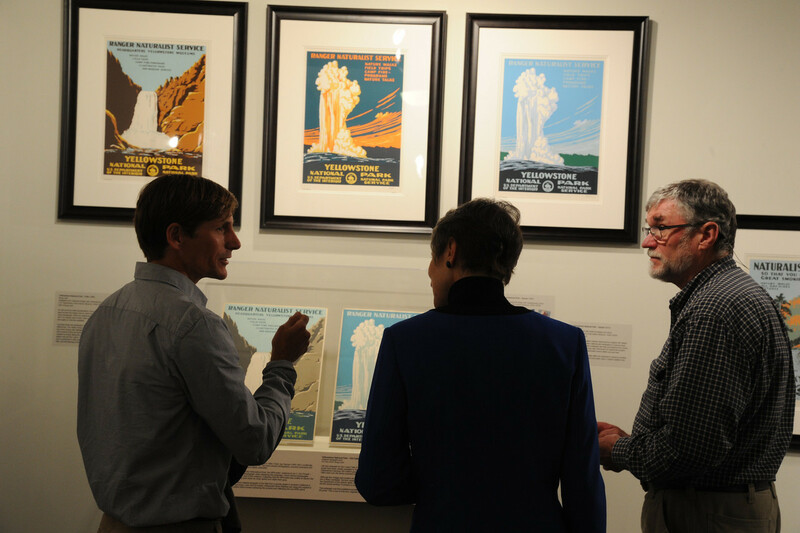 As many of you know, screen printing in poster format is a dying art and we're the only source for screen printed WPA National Poster art. Welcome Cole! The serigraphed print of Big Bend National Park is now available in time for the holiday season. Also available in cardstock. Thanks for you patience. 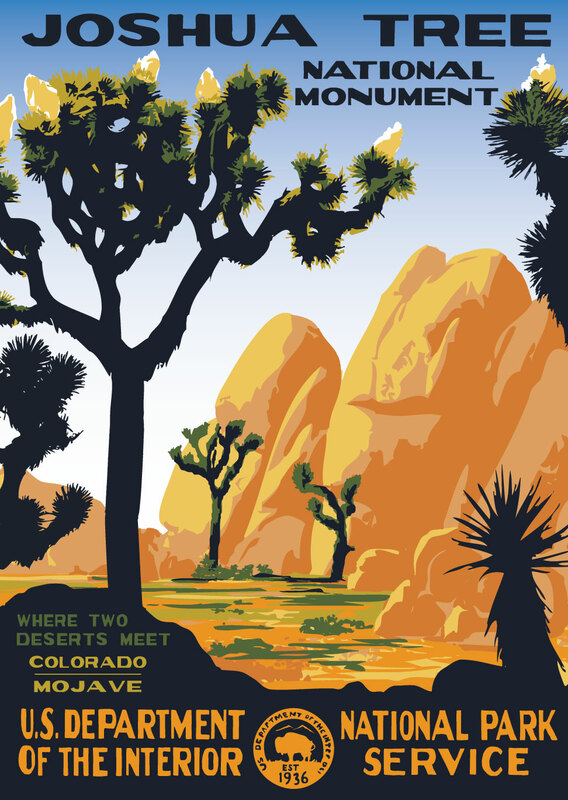 The National Parks Poster Art of the WPA 2013 calendar is now available directly from barnesandnoble.com and calendars.com. Glacier Bay Poster has just rolled off the screen presses and is now available for $40. It is one of three Alaskan poster images and is also available in post cards and notecards. We've also just finished our Badlands National Monument design due out by mid-April. After 10 years of increasing internet orders, we’ve decided to upgrade our website once again. We’ve hopefully made it easier to navigate and order products. We now list our poster images both alphabetically and geographically with a spiffy WPA map of the USA. Simply click on the image or location you want and it will take you to that selection of posters or cards. On this page will have all details about the image (size, coloring, card groups, etc.) From there, you can proceed to the shopping cart. Additionally, we’ve updated our customer comments section, making it easier to post your comments, ask questions or simply to read what others say about us. We’ve added a new section “Honorable Mentions” listing books, movies, gifts, etc. for which our products have been selected. Having problems finding something? Send us an email. The 2012 Barnes & Noble WPA National Park Calendar is now available through the Barnes & Noble Bookstores only. We do not carry it at Ranger Doug's Enterprises. The Everglades serigraph poster is now available here on our website and also from Everglades National Park. Glacier Bay is next up and should be available end of January 2012. The Everglades image has been completed and is available in cards. The screened poster will be available sometime late 2011. This poster was created after an on-site visit and indeed the animals in this image are as plentiful as depicted. While this was our first visit, it is now one of our favorite parks! The Glacier Bay image has been completed and is available at this time in cards. The screened poster will be available sometime late 2011. The popular calendar with Ranger Doug's national park images is produced, distributed and sold by Barnes and Noble bookstores with permission of RDE. There is a 2011 calendar available in B&N bookstores. It is not available from Ranger Doug's Enterprises. Thanks for your interest in RDE. The Saguaro and Chief Mountain designs are now available as cards; posters are due out this summer. This completes our Series IV designs which are available as a notecard set. The General Grant Poster is now available. Due to supply issues, we are changing our poster paper to an acid free Neenah Environment 80 Cover in natural white. This paper is slightly more supple, with a different feel, and easier rolling characteristics. Eli Ellison learns how the former National Park ranger resurrected a long-forgotten series of Depression-era prints. 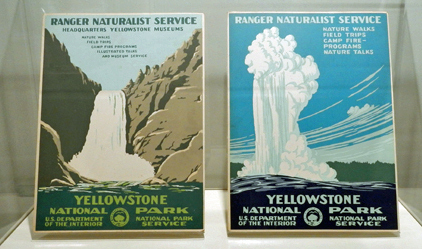 The Yellowstone Geyser poster is now available in two colored editions; the original WPA colors and the traditional RDE colors. The Blue Ridge Parkway poster is now available. A centennial edition is also being offered exclusively by the park. 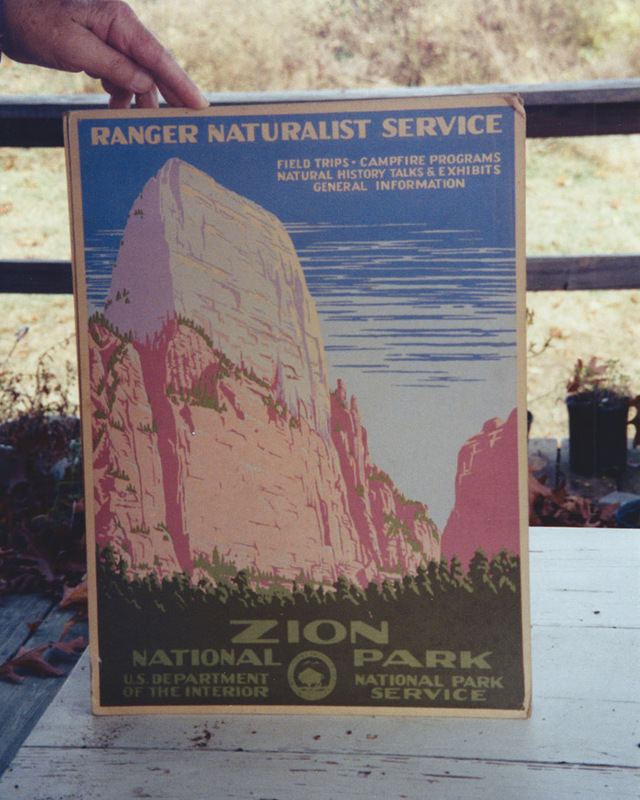 The Zion Centennial Limited Edition Poster is now available from both Zion National Park and here on our website for $100. This poster has been recolored to the original poster colors with a split fountain screen--where two colors are bled together on one screen making each poster unique. We have added the 100th year silver logo at the bottom and limited this edition to 200. We will continue to publish both the RDE sunset colored version along with an open edition original colored poster for $40.